Garden Path Bricks are available for purchase to honor individuals, clubs, programs, special occasions, years of service, etc. 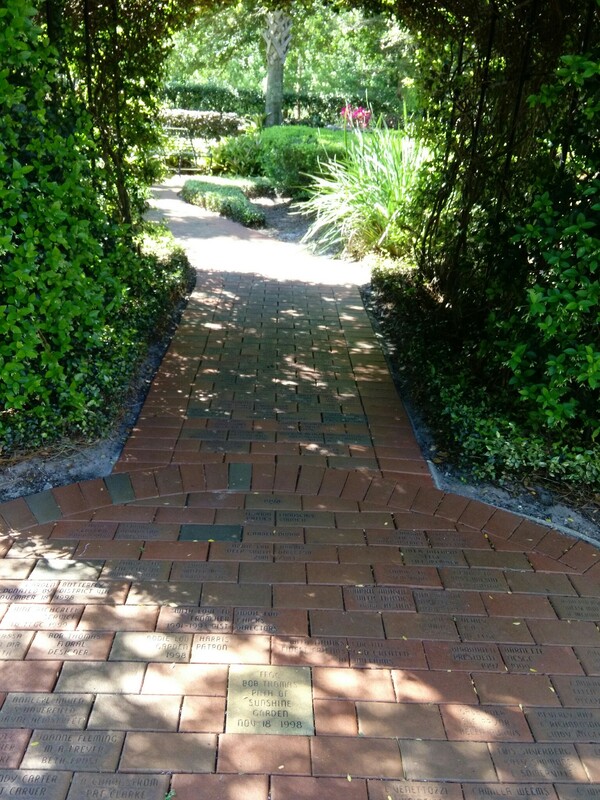 Each brick is placed along one of the garden paths at FFGC Headquarters. To order, click here to go to the Donation Page and don't forget to include the inscription you want. Alternately, please complete the Garden Path Brick Order Form and return by mail to headquarters with a donation of $50.00 for each brick. The Earth Steward is one who has been recognized for outstanding efforts in the stewardship of our natural resources in the field of gardening, landscape design, education, or legislation. The Earth Steward Application must be completed and sent to the Chairman by the an individual, a club,or a circle. The donation is $100 which goes to the Color Our Garden Fund, a part of the Headquarters Endowment budget for the continued stewardship and care of the grounds at FFGC Headquarters. The recipient is presented with a certificate and pin. This is a high honor in recognition of distinguished service. The name of the Guardian is engraved on a 3" x 11" bronze plaque permanently installed on the brick Guardian Wall at FFGC Headquarters. The Guardian plaque donation is $1,500. Please fill out this form and send to FFGC Headquarters. For more information or questions, please contact the Chairman. The Hall of Fame is awarded to an individual who has made a special contribution to their club, community, or a particular phase of garden club work. It may be requested by FFGC Garden Clubs, Districts, Board of Directors, or other groups affiliated with FFGC. The FFGC President may choose, during her term of office, to award the Hall Fame to individuals who have made a special contribution to her administration. The Hall of Fame Application must be completed and signed by no less than two club or circle officers (as the case may be). The honor donation is $100 made payable to FFGC no less than 4 weeks prior to the presentation date. Contact the Chairman with any questions. A club, circle, district, council, or an individual may honor themselves or another with a Life Membership. Once received, a Life Member no longer has to pay yearly club dues. Life Members receive the Florida Gardener, FFGC's quarterly publication, for life regardless of their continued activity in their club (or not). The member is awarded a certificate, a pin, and life membership card. FFGC Life Memberships cost $300.00. The Life Membership Application form must be completed and forwarded with payment to the Chairman. Deep South Region Life Memberships are available to individuals residing in any of the regional states: Florida, Georgia, Alabama, Louisiana, Mississippi, or Tennessee. Purchase of DSR Life Membership helps to fund the DSR Scholarship. This $1,000 college scholarship is awarded to a high school senior in one of the above mentioned states to pursue a course of study in a garden environmental or related field. The DSR Life Membership Form must be completed and returned with a payment of $50.00 to the Chairman. Recipient receives a certificate and pin. National Garden Club Life Membership honors a member or non-member with an expression of gratitude for their dedication to the aims and ideals of NGC. Funds collected from NGC Life Memberships are divided equally between the Scholarship Fund and the Permanent Home and Endowment Fund. New NGC Life Members receive a membership card and lifetime subscription to the The National Gardener. The NGC Life Membership Application must be completed and returned with a payment of $200.00 to the Chairman. Patrons, who have contributed $500.00 or more to FFGC State Headquarters, are recognized with a permanently installed brass plaque at the headquarters building. Please complete the Patron Plaque form and return with your donation of $500 or more to the Chairman or directly to FFGC Headquarters. This honor was established to provide special recognition for members of pride, purpose, and productivity in garden club work. This honor is awarded by FFGC clubs, members, circles, districts, or councils. The Pillar of Pride Application must be completed and returned with a donation of $100.00 to the Chairman. Recipients receive a certificate and pin.